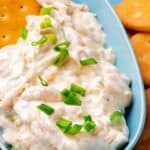 Sour Cream and Onion dip is the ultimate party staple! My version of onion dip is made with fresh caramelized onions, sour cream, chives, and some lemon juice to brighten it up. It's perfect served with crackers, bread or fresh veggies and will be the first thing gone on the party table! In a heavy-bottomed medium-sized skillet, heat olive oil and butter over medium heat. Once hot, add onions and salt and cook, stirring frequently, until they have turned a dark golden brown and are well caramelized, about 15-20 minutes. You are not looking to “brown” the onions, so if they start to get crispy, turn the heat down and stir often. Remove onions from heat and allow to cool completely. In a medium-sized bowl, combine sour cream, cream cheese, lemon juice and chives. Fold in cooked and cooled onions and season with salt and pepper to taste. Chill well. Serve with potato chips, raw veggies, bread cubes, butter crackers or whatever else your little heart desires.